Home Elbrus, status, Tindarnir SJÖ Elbrus – toppadagur ! Vá thvilikur dagur ! Vid heldum af stad kl 3 i morgun og gengum fyrst i myrkri. Smasaman fengum vid ad upplifa storkostlega solaruppras og svo skuggan af elbrus. Tetta var sterk upplifun. Eftir thonokkud brekkubrolt nadum vid a tindinn oll sem eitt !!! Tad var fagnad a toppnum og audvitad teknar toppamyndir. Nokkrir i hopnum fundu fyrir hofudverk og ogledi en allt saman hafdist tetta og tad voru godar adstaedur a fjalli. Teymid er gridarlega sterkt og vid erum oll gridarlega thakklat fyir tennan dag. Vid toppudum kl 10.30 ad stadartima. What an amazing day! We headed out at 3 am this morning and started walking in complete darkness. Slowly we started seeing the sun rising and then the shadows of Elbrus. It was an amazing experience. 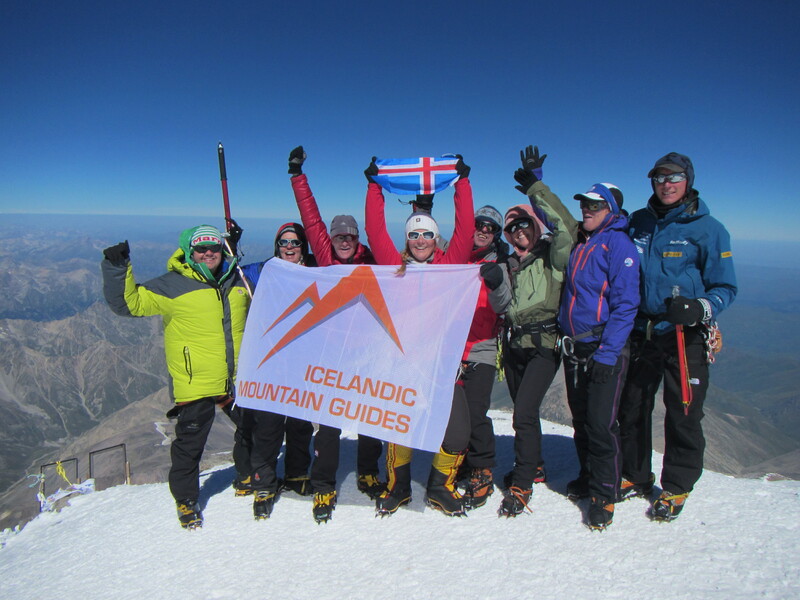 After few steep hills and climbing, we finally reached the summit – the whole group! We of course celebrated at the summit and took our summit pictures. Few of the group experienced headache and a little nausea but we all made it to the top – and there were perfect conditions for summiting. Our team is amazing, strong and extremely grateful for this day. We reached the summit at 10.30 am local time. 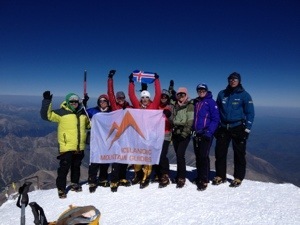 Best regards from our team at Elbrus.